Ten men have been found guilty and a further 16 have admitted involvement in what the RSPCA says is one of the largest dog fights it has uncovered. Both dogs were found with multiple bite wounds. In February 2006 a passer-by tipped off police after seeing a large group of men enter a building in the Alum Rock area of Birmingham, in what appeared to be suspicious circumstances. It led West Midlands police to uncover what they believed to be a dog-fighting ring, calling the RSPCA immediately. 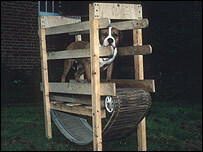 The society's Special Operations Unit had been investigating suspected dog-fighters in the area at the time. 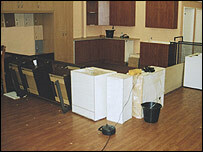 When the RSPCA visited the building - a kitchen interiors shop - they found cupboards had been taken out and converted to make a pit - much like a boxing ring - for the fight between two dogs to take place. One of the dogs was found in a cupboard in a pool of blood, with multiple bite wounds and a bloodied head and legs. It died a few hours later. The other was so badly injured it was put down 48 hours later. Both would have been extremely fit and strong pit bulls before the fight, which is estimated to have lasted for an hour-and-a-half. The prosecutor for the RSPCA, Nick Sutton, told the court it was "an extensive fight. It was a fight to the death." In a video shown to the jury squeals of pain could be heard and phrases such as "shake him" and "come on boy" as the dogs bit each other. While it is not yet clear in this case how the dogs were trained for fighting, methods can include provoking the dogs from a young age to encourage them to be aggressive and putting two dogs together for unofficial "bouts" or rolling. It can also involve fitness training such as putting them on treadmills and jaw strengthening with tyres. In some cases, drugs may also be used. There are believed to be hundreds of people involved in organised dog fights across the country. 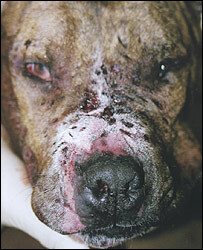 Since 2000, the RSPCA has prosecuted around 150 people for dog-fighting related offences. The practice was banned in the UK in 1835, but experienced popularity in the 1970s and 1980s. It was largely stamped out after the Dangerous Dogs Act 1991 and a number of successful operations, but in recent years there has been a resurgence in the popularity of dog-fighting. But Chief Inspector Mike Butcher, of the RSPCA's Special Operations Unit, believes the nature of dog-fighting is changing. He says that previously it was done more for "prestige" than betting. Dogs were trained as a prize-fighter would be - in a regulation-sized pit with fixed rules and a referee, and would be stopped when one of the dogs had won. Owners would also treat their dogs' injuries. Now, he says, there is an increase in "urban street-fighting", where the "emphasis appears to be more on betting and fighting the dogs to the death".